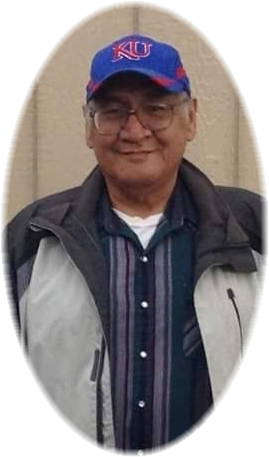 A loving father, brother, uncle, grandfather and friend, Harold “Vance” Littlebird, Ho’néhešéeše “Laying Wolf”, age 66, of Lame Deer, MT made his journey to Ma’hēō’o surrounded by loved ones on January 30, 2019. Vance was born August 26, 1952 in Crow Agency, MT to James and Harriet King Littlebird. He attended school in Busby, MT, achieving his GED in 1978 at United Tribes Technical College in Bismarck, ND. He also received vocational training as a carpenter at Chief Dull Knife College in Lame Deer and as a painter at UTTC. Vance married Esther Brady in March 1971 in Lame Deer. They remained friends throughout the years for the love of their children and grandchildren. He held various jobs throughout his life. He worked as a corrections officer at the Northern Cheyenne Police Department, Arts & Crafts in Ashland, Montana Power Company for 17 years and the Northern Cheyenne Tribal Housing Authority. In his younger years, he enjoyed playing the drums at local dances with the band “Plastic Justice”. He also enjoyed boxing and rodeos. His mother and father also traveled the pow wow circuit where he was a fancy dance champion. One of his favorite activities was going to the handgames with his baby Sereda and partner in crime Cyro. His grandfather Ernest King introduced Vance to Native American Church, becoming a devout member and Road Man. He was a strong believer in prayer in the NAC ways. He instilled these teachings to his children and grandchildren reminding them that whatever hardships they may have endured, prayer will guide them. Through his kindness and prayerful ways he attained many friends throughout his life. Vance’s life revolved around Bear Butte and the power of prayer that exists there; he fasted 9 times. He also passed on his teachings and paints to the people who came to him for help, never saying no to prayer. When it came to prayer he was taught by the old people never to say no. He was also the North Side Headsman of the Elk Horn Scraping Society. Vance whole-heartedly loved his children, grandchildren and great-grandchildren. He prioritized all aspects of his life for them. Before his death, his last request was to make sure that his grandchildren and great-grandchildren were taken care of and to never leave them behind. He told his daughters not to ever give up on them. Vance was preceded in death by his parents James & Harriet Littlebird, Horace & Mabel Small, Jasper & Elva Redhat. His brothers: James Littlebird, Jr, Gerald Littlebird; Sister Ernestine Whitewolf; Children: Norene, Vance & Lance Littlebird; Grandchildren: Cyro Littlebird, Frankie Jo Limpy and Zion Limpy. He is survived by his daughters: Beverly (Brian) Limpy, Monica (Dominic) Norse, Sereda Littlebird, Melissa (Isaac) Royston, Michelene Bearcomesout; Sons: Drew Old Man, Derek Knows His Gun, Geofredo Littlebird, Jr and Michael Bearcomesout, Jr., Alvin Strange Owl; Brothers: Geofredo (Jackie) Littlebird, Max Hiwalker, Lloyd Littlebird, Glenn (Lillian) Littlebird, Horace (Avalee) Small, Jr., Clayton (Maha) Small, Clifford (Octa) Small, Scott Rinehart, Robert Shotgunn and Gerald Panana; Sisters: Mary Fay Bailey, Geri Small, Jenny Lou Lafranier, Wanda Martinez, Gail (Joe) Small-Rodriguez, Carla Small, Tanya Ishikawa, Tina Purcell, Clarice Walksalong; Grandmother: Susie Tallwhiteman-Cain; Father: Dixie Rinehart; also, all of his Native American Church brothers and sisters, too many to mention. Grandchildren: Dalen Littlebird, LaNeicho & Lazhona Norse, Haden Standing Water, Sancha & Elizabeth Tobacco, Janae Limpy, Rayleah Ontiveros, Cattalaya & Serenity Littlebird, Noreen, Luke & Alan Old Man, Tazhea & Josiah Small, Bailey Whitewolf, Grant, Veronica, Cassandra & Daniel Baker, Clarice & Clarissa Jefferson, K’Chan & Wylie Bearcomesout, Tristan Bends, Cedar Stump, Talisa, Shiree, Sionne, Angel, Gordon and Lara Strange Owl. Adopted children: Jessica Hawley, Leroy Not Afraid & Delphine Medicine Horse. God Children: Frank Flying, Sr, Robert D Bailey, Beverly Bailey & Melissa Brady. Great-Grandchildren: Julian & Lanie Littlebird, Jimmy Littlebird. Vance had so many relatives and friends, too numerous to name, please accept our apologies if we have forgotten to mention anyone in our time of grief. My sincere condolences to the family and friends. May the God of comfort and loved ones continue to surround you with love and support during these painful days(2Cor 1:3,4). TO THE FAMILY OF HAROLD EUGENE LITTLEBIRD, THE NORTHERN CHEYENNE CHIEF COUNCIL EXTEND THEIR MOST SINCERE CONDOLENCES AND PRAYERS FOR STRENGTH DURING THIS MOST SAD, SORROWFUL AND MOURNFUL TIME FOR THE LOSS OF A BELOVED LOVE ONE. Uncle, There are no good byes…Until I see you again, travel well. Love you! Uncle Vance will be greatly missed. I’m grateful for the meetings him and his staff had for my kids and I. Love you dear sisters! We love you and will miss you Uncle, travel safely to the next camp. Lauren, Dustin, Tatum and “Spider-Man”. Leave in a good way. Tell my dad, I love and miss him. I’m sure he will thank you for assisting him on his journey when it was his time. I will always remember that and I was always grateful for your help. Have a good journey, I will see you again. You helped me when I most needed it, a in just the right way. Thank you. I will always remember your kind, gentle soul. God Bless You. Sending my sincere condolences to the family. May Gods peace and comfort be with the family, my relatives. Condolences and prayers for Vance and his family at this very difficult time. I will always remember vance kissing someone and totally embarrassed them he was so fun to be around and always smiling. I am so sorry to the family prayers. Sending love and Prayers. Love you all, Beverley, Monica and Sereda and rest of the family. Sending Prayers and Condolences to Vance’s family. May God comfort you.